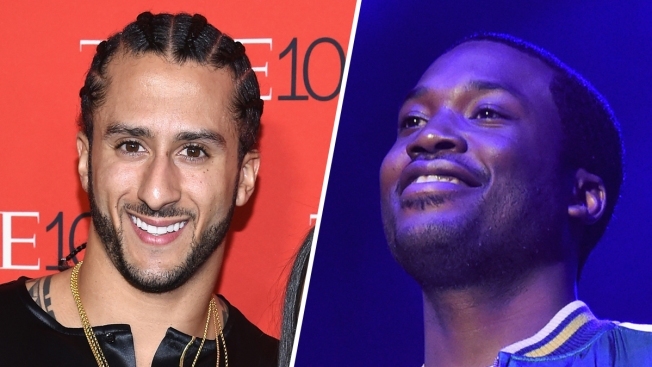 Civil rights activist and former NFL player, Colin Kaepernick, is sharing a conversation he had with jailed Philadelphia rapper Meek Mill. The rapper's legal team has filed a motion to get the judge who sentenced Mill to prison to recuse herself. Colin Kaepernick, the former NFL quarterback who started a movement of football players protesting during the national anthem, is now putting his support behind imprisoned Philadelphia rapper Meek Mill. Kaepernick says he spoke to Meek Mill, who is currently serving two to four years in a Pennsylvania state prison for violating probation. "Spoke to Meek Mill & he wanted ppl to know regardless of his unjust situation, he’s in good spirits & humbled by the support the people have shown him," Kaepernick tweeted Monday. "We'll continue to fight against the harsh sentencing practices that have affected Meek & millions of other [people of color] for generations." Spoke to Meek Mill & he wanted ppl to know regardless of his unjust situation, he’s in good spirits & humbled by the support the people have shown him. We'll continue to fight against the harsh sentencing practices that have affected Meek & millions of other POC for generations. Mill's legal team has been fighting for the release of the 30-year-old, whose real name is Robert Rihmeek Williams, since Common Pleas Judge Genece Brinkley put him behind bars in early November. A PR blitz — including a New York Times op-ed from fellow rapper Jay-Z, star-studded rallies and bus ads — has called for Mill's release. His supporters argue that the rapper was sent away on the whim of a judge, against the recommendations of prosecutors. His attorneys have called on Brinkley to remove herself from the case saying she's been unjust. Kaepernick, who took a knee during the national anthem before each game last year to protest police mistreatment of people of color, has not been signed by any NFL team this season. Last season he played for the San Francisco 49ers. Other NFL players, including Philadelphia Eagles star Malcolm Jenkins, have continued to protest during the Star-Spangled Banner before games. Jenkins has used his protest as a platform to promote criminal justice reform. Jenkins also appeared at a Free Meek Mill rally last week.